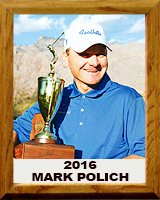 Mark Polich moved his family from Minnesota to Tucson, Arizona, in the summer of 1998. In 1999, he started the high school girls’ golf program at Catalina Foothills. The first year, the program was an intramural program and then began playing at the varsity level in 2000. Polich had a two-fold motivation for starting this program. First was to give girls a chance to participate in this wonderful, lifelong sport, and the second was hoping that if girls began playing golf, perhaps they would spend more time with their parents on the golf course, precisely at a time when the typical teenage wants little to do with their parents. The first year was a huge challenge for all involved, but especially for Polich. He quickly discovered this his background as an elite level golfer did not automatically translate into being a great coach. The players, parents, school administrators and Coach Polich all managed somehow to survive that first season. The team even qualified for the state championship and finished in 6th place. But more importantly the players got inspired to learn how to play golf. It was exhilarating for all involved. In Polich’s second year (2001), Catalina Foothills girls won the region championship and finished 3rd at the state championship. In his third year, Catalina Foothills finished in 4th place at the state championship, but only 12 shots out of first. This is the year that Coach Polich learned one of the most valuable lessons of team sports. Although Catalina Foothills had defeated all the top teams in the state during the regular season, the team entered the state championship without one of their key starters who decided to quit the team after disciplinary action sidelined her for 2 weeks during the season. It was then that he learned the value of team rules and how no matter what the cost, all players must respect their teammates and opponents and coaches, and if they could not do this, regardless of their ability, they would no longer be a member of the team. Without this player, Catalina Foothills finished 4th as a team at the state championship. But this really set up the program for a phenomenal 8 year run (2003-2010) in which the players continued to work hard and improve and achieved great success. Polich also was the lead coach that spearheaded a change that stands today allowing coaches to actually “coach” their players during competitions. He surveyed all high school coaches and worked diligently to persuade them as to the benefits of working with the players during a competition just as any coach would in any other sport. He made a formal presentation to the AIA board in support of this proposal which passed. Prior to the AIA making this rule change, coaches were forbidden to talk with or help their players during a competition.